The Earth Defense Force has its array of various enemies-giant ants, spiders, UFOs, robots, etc. In terms of player characters, while the arsenal has been quite plentiful, the only choices have been the standard infantry unit and the flying Pale Wing. Earth Defense Force 4 is mixing things up a little more with the addition of a new class: The Air Raider. According to Weekly Famitsu, the Air Raider comes with its own unique abilities like lazing targets, calling in air strikes, setting up support units and turrets, requesting vehicle drops, and using remote detonating bombs and directional mines. Overall, the unit seems to be geared for a support position in multiplayer, although it is probably tuned to be able to hold its own in the single player campaign. Of course, with new ally units, there must also be new enemy units. 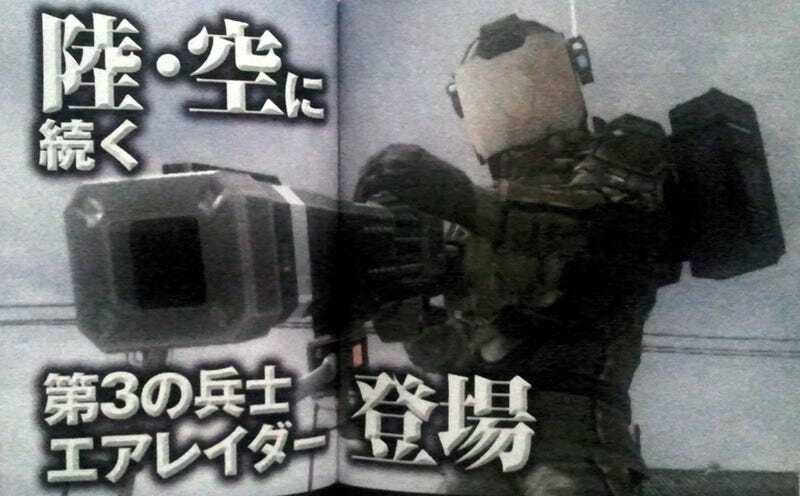 D3 Publisher has also released information of a new type of giant robot. Based on the red-eyed Hectors, this new green-eyed Hector will have upgraded armor and new weapons, including what looks to be a barrier emitter. Earth Defense Force 4 is scheduled for release in 2013.